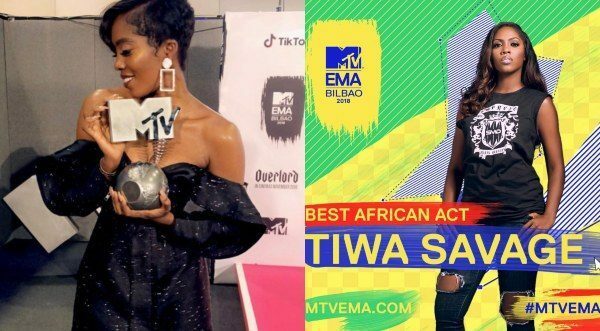 Nigerian singer, Tiwa Savage has become the first Nigerian female artist to win the MTV Europe Music Awards (MTV EMAs) in the Best African Act category. The Afro-pop singer snatched the record-breaking award at the 2018 MTV EMAs held on Sunday at the Bilbao Exhibition Center, Bilbao, Spain with several music stars across the world in attendance. The African act category, in 2005, was infused into the MTV EMA to enhance musical alliances across borders, and promote cultural integrations. Celebrating the award, Tiwa took to her Instagram page @tiwasavage to dedicate the win to African women and aspiring young girls. She said, “Almighty God, you are so faithful. My savage soldiers did it for me. “You have stuck with me through the roller coasters. Thank you. To my amazing team, this is just the beginning. African women, this is for us. “I have been through a lot but I have kept my head up and weathered the storm because I know some little girl somewhere is dreaming like I did,” Tiwa said. She signed a recording contract with Mavin Records in 2012 and currently has a songwriting deal with Sony/ATV Music Publishing. The mother of one also signed a management and publishing deal with Roc Nation in June 2016. However, the biggest winner at the awards night was the Cuban-American singer Camila Cabello. She scooped four awards, winning “Best Song,” “Best Artist,” “Best Video” and “Best U.S. Act” in a show that featured a stellar performance from Janet Jackson. Cabello, 21, who already led the pack at the MTV Video Music Awards in August, urged her fans in the United States to vote in the 2018 midterm elections as she walked the red carpet in the northern Spanish city of Bilbao, Reuters reported.